Anita Wood Elvis Why I Didn't Marry Elvis Presley? 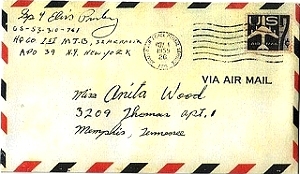 Anita Wood Why I Didn’t Marry Elvis Presley ? Wedding bells almost rang for Anita and Elvis, who dated seriously for several years, Anita married NFL football star Johnny Brewer. Today she teaches Christian School in Mississippi. Why is this the first time you’ve spoken about your time with Elvis? I really dont do any interviews because it makes me sad sometimes when I think back to Elvis tragic death, he should still be here with us and I just get upset. So I’ve stayed at home in Mississippi with my husband, three children and six grandchildren. Tell me about your first date with Elvis? I went on to do Dance Party with Wink Martindale which was a Saturday programme for teenagers where George Klein worked. I really was not an Elvis fan before I met him but I was a disc jockey and I did play his records. Well, one particular Saturday Lamar Fike called me and said that Elvis would like to meet me and I told him that I was sorry but I already had a date for that night. I explained that I couldnt let my date down, Elvis wouldnt have liked it if it were him and that I was very sorry. A couple of weeks later Lamar called again and said Elvis would like a date and was I free that night. At the time I was living with a lady that I had met called Miss Patty who became a real mother figure to me and I told Lamar to ask Elvis to pick me up there and we set a time. When he came buy in his Cadillac, Elvis was driving. He sent George Klein up to the door, which was a big mistake, and Miss Patty told him that she was sorry but Elvis would have to come himself if he wanted a date. Anyway, Elvis came back with George, this was just after he had made Loving You and he wore a red velvet shirt and looked very, very handsome. I must say that he was the best looking man that I have ever seen. Anyway, George made the introductions to me and to Miss Patty who told them to have me back at a sensible hour or she wouldnt let me go. I went out to the Cadillac and there was Lamar and a few other guys. We just drove around laughing and talking, having a great time. Elvis got hungry so he stopped by the store for some hamburgers. We drove up to Graceland were I remember he had a whole lot of teddy bears in the dinning room. All of a sudden Elvis said, I want to show you my bedroom and so we went upstairs and he started to kiss me. Now, this was the first date and his hands started to move were I thought they shouldnt so I said, I think I need to go home now. He acted real nice, we went down stairs and he took me home. And the second date? The second date was a couple of nights later and we went up to Graceland again. You know Elvis still had an old truck and wed get in it and he would drive me down to Lauderdale Courts to show me where he used to live. Hed show me around Memphis and nobody would ever bother us because they really didnt recognize him in that truck. We just went back to his house, we watched television, ate and had a good time, then Elvis took me home. How long were you with Elvis before you both felt that you were really in love with each other? Well, Id never really had a serious boyfriend because my parents were very strict. I wasnt allowed to go on dates and I was nineteen when I met Elvis so he was really my first one. Ive always said that Elvis was my first love but Johnny is my true love. Elvis and I saw each other a lot and after about two months we were on a date and after he took me home we stood on the porch and he said, Little, I think Im falling in love with you. He was loving, kind and he made me laugh. What are you recollections of Elvis army induction? When Elvis was inducted into the army I had to go to New York for thirteen weeks to work on the Andy Williams talk show. Before this though, Elvis took me to Killeen, Texas where he was stationed. His mother wasnt feeling to good at this time and I thought the world of her. She and I often talked about the time that Elvis would marry me and we would have a little boy and that just made her very happy. But anyway, she got real sick and Elvis called me one morning and told me of her death. I drove up to Graceland and there was Mr. Presley and Elvis sitting on the front porch and they were so sad. I couldnt really sympathize with them because at that time I didnt know what it was like to lose a parent. When I did loose my Dad, I talked to Elvis to let him know that I knew how he had felt. 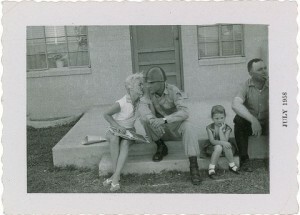 After that I spent time with Elvis on base at Fort Hood with his family. Elvis looked tanned and wonderful. He had no dye on his hair, it was not a crew cut but it was cut short, he looked great. I would just go over and it was like a regular date but the guys had to be with us all the time but I love them, really. Wed go to Waco to visit friends and have a really good time. I understand Elvis bought you a 1957 Ford and a diamond friendship ring before he left? He gave me a lot of things but I never asked for anything because I loved him. The ring was the first thing he ever gave me and now my daughter has it and she wears it to this day. I gave the car to my brother when I got married and I gave certain toys and jewelry that he gave me to my bridesmaids. I thought that my husband would not appreciate me bringing these things into our marriage, gifts I received from another man. I would not appreciate him doing that so I gave everything away except that little ring. Do you have any photographs of Elvis that we havent seen? You know, I do have one of Elvis when he came by Miss Pattys. We were standing out front talking when the picture was taken. I do have some pictures but Elvis did not want the newspapers to know anything about how serious we were so not many photographs were taken. In all honesty, why didnt you two get married? Elvis told me that Colonel Tom Parker had said no because if he got married or engaged or anything, with that kind of career, he didnt need that kind of publicity. How did you finally find out about Priscilla? 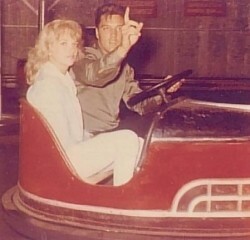 I was with Elvis when he was shooting movie in 1962 and one time when he went to the studio I stayed at home. I was up in Elvis room looking through some books in the library and inside one was a letter. I opened the letter and it was from Priscilla. Let me tell you, I was mad because he had not mentioned any other women. When I asked him about it he got upset and told me that it was just a love letter from some fan. We had a big fight and Elvis grabbed me and threw me up against the closet. Things obviously became difficult from then on. How did it finally end? One afternoon Elvis was sitting in the kitchen, I think he was with Alan Fortas, and I was on my way down the backstairs. All of a sudden I heard Elvis say, Im having a hard time making up my mind between them. I was hurt and I walked in and simply said, well, Im going to make your mind up for you and I left. I wasnt going to remain there in that situation. Elvis came after me and said, I prey to God youre doing the right thing and I told him that it didnt matter and it didnt make any difference. Elvis became upset and Mr. Presley began to cry too. Elvis was trying to put money in my purse and I just didnt know what was going on. It was very hard but I never went back.